Fourlane Ford is conveniently located in Central Alberta at 4412 50th Street in Innisfail, just 15 minutes south of Red Deer on Highway 2 between Calgary and Edmonton. We have 15 years of experience serving satisfied customers! If you’re looking for a vehicle, browse our exciting lineup of new Ford vehicles as well as our updated used vehicle inventory. Our experienced sales staff are eager to share their enthusiasm and their knowledge of Ford products and services with you. We encourage you to browse our online inventories of new and pre-owned vehicles, schedule a test drive of a new Ford and discover our current promotions. You can also request more information about our financing services or about any vehicle using our online form included here, or by calling us at 1-800-895-4651. 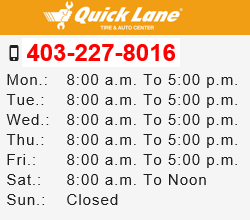 Please note: Parts and Quick Lane Service are closed on long weekend Saturdays.